From left: The Wadhawan family—Wadhawan Global Capital Chairman Kapil Wadhawan; his wife, Vanita Wadhawan; children Tiana and Kartik Wadhawan; and mother, Aruna Wadhawan. 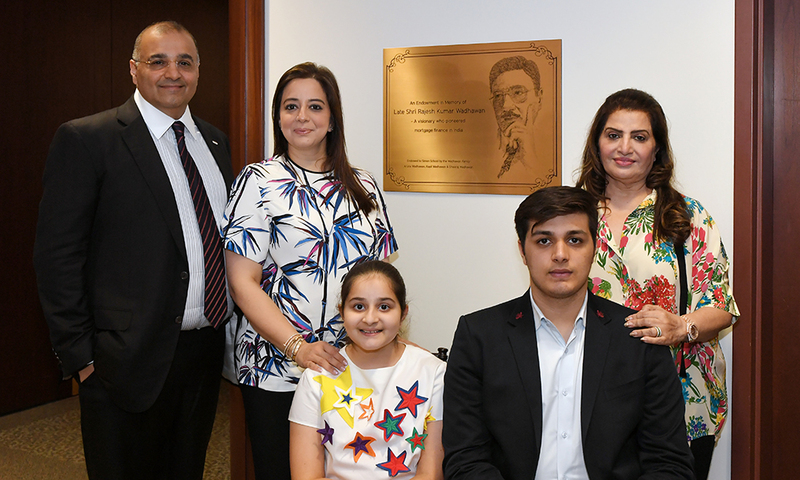 Wadhawan Global Capital (WGC), a Mumbai-based financial services company, has fulfilled a $1.5 million commitment to the Simon Business School to establish the Rajesh Wadhawan Professorship. Named in memory of the company’s founder, the professorship will focus on research in development economics. The gift reflects the late Rajesh Wadhawan’s personal interest in empowering societies through fair access to credit. It will provide support for a full-time faculty member at the Simon Business School to conduct research and develop curricula that furthers the understanding of economic problems in developing countries. Founded in 1973, WGC has more than 10 million customers and an asset base of $18.6 billion. The Rajesh Wadhawan Professorship will increase WGC’s global reach as they continue to deliver transformative socioeconomic change in a profitable business model.